I met my lovely wife as a freshman at Ithaca College. We just celebrated 19 years of marriage (2 children, 4 addresses and 6 cars ago) and since her parents still live near Ithaca we've made the trek back up South Hill several times since graduation. Our school song (LAME though it is-- aren't they all??) starts with "high above Cayuga's waters" and the view lives up to the lyrics. 19 years after graduation, it was time for a victory lap. Another peaceful upstate New York morning tickled the grass and swaying treetops outside the bedroom window. We wanted to take the kids hiking in one of Ithaca's "gorgeous gorges" parks-- something we'd done many times while dating in college-- so they could get a taste of the natural beauty the glaciers left behind. The trip to Ithaca would be less than 20 miles (so not a challenge to the Tesla). It would also be a quiet side trip mostly out of the public eye, but especially at this-- the Tesla excels. The car is arguably most impressive when there is no one else to impress. Dawn slowly clawed free from the darkness and glimmered in through the window of my wife's childhood room. Coffee wafted under the closed door as we roused ourselves in the quiet solitude of a upstate New York. On the edge of the field by the warehouse our grey Tesla merged with the mist. Pondering the days' activities over breakfast, I was eager to walk down to where Serena was hobbled to a plug and waiting. She'd be ready for some fun and I was tickled with the possibilities of whooshing all that California horsepower through a sleepy farm community that had never seen an electric car that didn't fit under the Christmas tree and come with a remote. It isn't about showing off, it's about showing the possibilities... and sometimes a glimpse is all it takes to put wondrous plans in motion. My dream as a teenager was to be an automotive engineer. Specifically, I had a strong interest in the nuances of crash testing and materials (as they related to that balance between weight/safety and strength/energy absorption). I made it most of the way through high school before I realized there was a fatal flaw in my plan: I can't do math. Fortunately I parlayed all those hours watching television into a career-- and now I rarely have to do math. BULLET DODGED! But then I bought a Tesla... which is much smarter than me... and math becomes an integral part of trip planning. Lots of it. Lots of planning... and MATH. Had I done it correctly or was another fatal flaw about to be revealed in my plans?? Winter has established a foothold here in Western Pennsylvania and we've already been pummeled by our first couple storms. Over Thanksgiving weekend we made a trip up to my wife's family home in upstate New York and because of the quick turnaround and cold weather we opted to take our Chrysler. It made the journey just fine but the fact that we took it speaks to a glaring (in our usage) hole in the Tesla Supercharger map... and brings me to the subject of my next series of posts: Traveling off the Supercharger routes. Fortunately for me, we've already done this trip with the Tesla. Whew. No "extra" road trip needed! Back in July we loaded up Serena from stem to stern (what other car can claim that capability?!) and headed out straight through the heart of Pennsylvania where no Tesla support can be found. A famous group of doped up exercise freaks has been celebrating zero emissions cross country travel for well over a 100 years now. For much of modern history the participants have also enjoyed their own version of “Supercharging” along the way-- but supposedly the Tour de France organizers frown on their creativity. Despite assurances that it’s returned to sobriety (like, for reals this time) I can’t spur myself to care anymore post-Lance Armstrong. My own excursions on my 2 wheeled range extender are more modest and much shorter than traversing France. If I’m honest they are probably not free of emissions either as all sorts of vulgar grumblings tempt my lips on the steeper inclines. 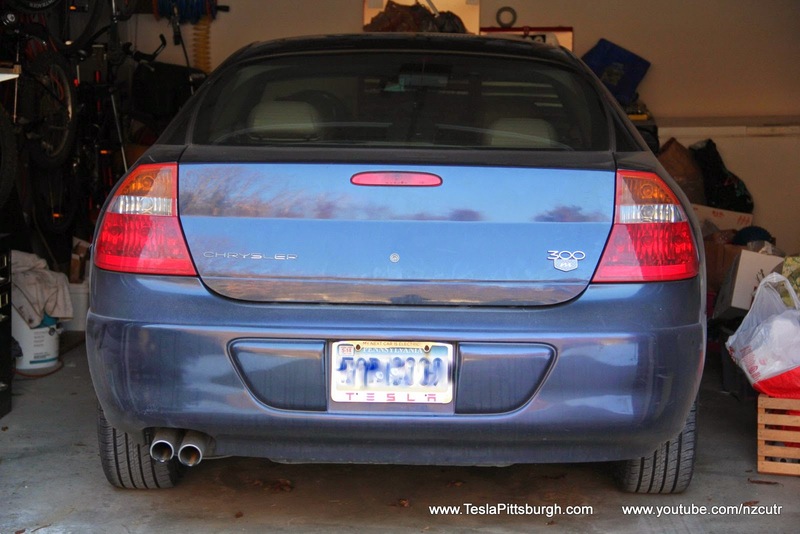 Among the hills of western Pennsylvania where our home is nestled, prudence suggests we start our trips from elsewhere... which nearly became a stumbling block to our Tesla purchase. If you've ever had the pleasure of going to a truly top-tier restaurant-- the kind of place that does NOT keep crayons tucked alongside the menus-- then you know what anticipatory service is like. Don't misunderstand me, I can't remember the last time I went anywhere that nice... but once upon a time, I did. The waiter was amazing, delivering sauces, refills and other tidbits before I could even start looking to see where he was. Chatting with Austin (my cousin in Colorado) one night, I was trying to convey how the Model S is designed to anticipate your needs. It all starts when you walk up to the car to reach for a handle that isn't there... or is it...? Tesla Supercharger Opens in Bricksburgh! Inspired by Lego's leaked new set featuring an exploding gas pump, I decided to see if I could whip up a proper alternative. Fortunately, I didn't have to look very far for inspiration... as we have a Tesla in our garage! Ran across this while researching stuff for my "other" blog hobby... from a leaked 2015 Lego product catalog. It appears to be an EXPLODING GAS PUMP. Please buy these by the pallet load for resale in your stores. ...but on the way there I caught a glimpse at a gas pump graveyard. OH. MY. Nothing short of a photographic gift. I was really hoping we'd have time to stop on the reverse trip... right up until we were boxed in by the property owner's truck. Everyone likes a bargain, even owners of (relatively) expensive EVs. The first question a new Tesla owner must address is: "how do I charge my car at home?" Almost immediately you're down to two options, the extra cost Tesla High Power Wall Charger (HPWC) or the included Universal Wall Charger (UMC). If you, like most owners, opt for the already included UMC, you'll find that Tesla has left you hanging. Literally. The UMC packs quite a bit of weight into its charging brick and it dangles precariously cantilevered on an adapter. Over time this weight can weaken the connections between the car and the plug, leading to the risk of overheating, arcing or a short circuit. To eliminate this problem you need to support the weight of the UMC. But can you do it cheaply? Owning a Model S in our area makes for a minor dose of celebrity. 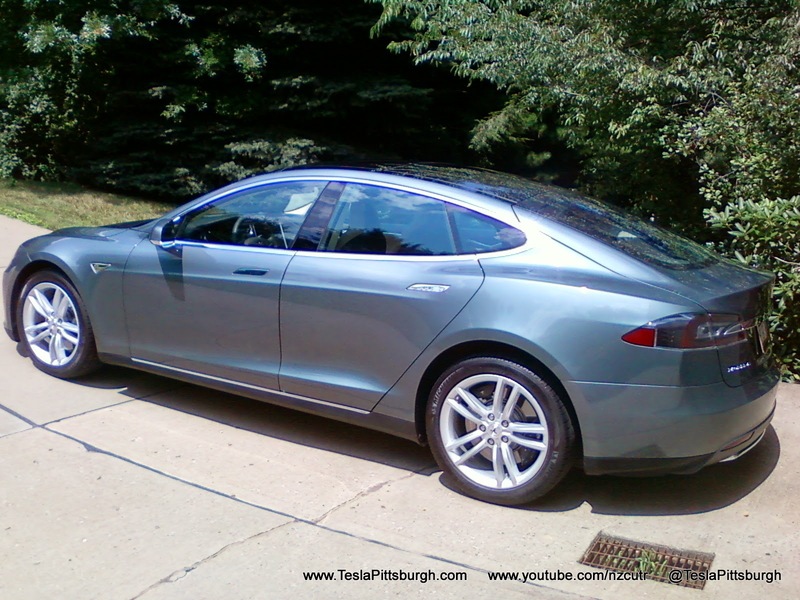 At the time of our delivery there were about 50 other Teslas in greater Pittsburgh, which made them more rare than Ferrari, Lamborghini, etc. The biggest difference, of course, is that the Tesla is an ideal daily driver so people have a decent chance of catching one out on errands. Even now, months later (surely Pittsburgh is nearing triple digits of Teslas), we still get a fair amount of attention. Funny. No one seems to notice when I drive my Subaru... which is even more rare. It's funny how the planning pendulum swings. As a pre-kid hip young couple you do everything on a whim-- but then the kids arrive and ruin that. Now you're planning around naps, eschewing long distance anything and schlepping tons of paraphernalia (items vast in their array of complexity and use), all of which conspire to keep you closer to home. The trips you do take are planned with military precision and coordinated attacks with other similarly constrained family units. Ah, but the kids... you feed them = they grow! Suddenly the kids are the ones asking to go places. They pack their own stuff and eagerly leap into the car ready to depart-- with all their mishmash of backpacks still safely in the house. Well... it is progress? Whatever it is, we'll take it! Off we go! This was originally posted/written for my Facebook account. Despite the lack-of-Tesla-ness in it, it was partly prompted by several Tesla-prompted comments made by people who had--for years-- ignored everything else about me. So. Here it is on my Tesla blog because I bet some of you have had similar experiences. It's been a while since I stepped up onto my Facebook soapbox but two trends have caught my attention and I'd like to draw yours to them as well. Perhaps with greater transparency we-- the collective "we", not the royal one-- can endeavor to improve communication within our own circles for the betterment of all. If I thought anyone reading this were "guilty" of these things they'd not have opportunity to read this for long (as my tolerance is very low) but rather I'm trying to encourage you to help me purge these as best we can. For the record, I don't approach this as a master of the language arts and I'm probably guilty of both these things either due to time, attention, bad recollection or laziness. I do claim, however, that it is the exception and not the rule. This is long... so click on through to get to the meat. It is, perhaps, the biggest question many prospective hand-wringing owners of the Model S wrestle with. Should I get the Performance version? After all, once you've talked yourself up the first $10k from a 60kwh to an 85kwh battery... what's another $12K or so for the Performance version? And if you don't pay for the upgrade to the more powerful drivetrain, WILL YOU REGRET IT LATER?! After nearly a week of celebrations, reunions, traffic and sightseeing, we finally found our trip winding down. The last stop before home would be in Somerset, PA at the Supercharger. Serena would get a snack and so would we... and we were happy to be back in familiar surroundings. The Somerset Supercharger is one of the cross-country lynch pins in the network... but it isn't the most impressive place to charge. I've tried for years to work up the nerve to go to the Flight 93 crash site. As far as I know I don't have any personal connection to anyone who was killed in the attacks for September 11-- and I'm sure by now I'd know if I were. Nor was I a first responder or a new recruit or the fulfillment of any other heroic role that was necessary that day. I was a father, playing with my son in our living room when the attacks happened. Watching the initial reports in shock like everyone else, I was soon summoned to work-- like many who work in the news business-- and it wasn't until later that it really hit me. Unlike the viewers at home, glued to their televisions, I'd spent the day watching the uncensored, unfiltered news... and it was horrific. It was sad. And as deeply inspirational as the story of Flight 93's passenger uprising is now, it was just another tragedy on top of many tragedies that day. I had the luxury of avoiding the crash site ever since then-- despite wanting to WANT to go-- and I had availed myself of that luxury for too long. Well, blow me down, me-hearties! That might not be as well known "pirate slang" as the shivering of ye olde timbers, but the meaning is the same. It's meant to convey a sense of such amazement and shock that you are startled to the point that you could be "blown down" as if dead. I suppose the modern equivalent would be something like "you could knock me over with a feather" but they hardly allows for a good "ARG!" When we'd left their mountaintop my uncle had suggested that by following Route 30 we would come across some of "his" windmills. Some?! Well, blow me down-- we came across LOTS!! After our hike around Shawnee State Park, we climbed back into Serena and turned West onto Route 30-- the old Lincoln Highway. Our next destination was the Flight 93 Memorial and we didn't really have any expectations of significant scenery until we reached it. Cruising down the road we blasted past a couple interesting roadside attractions but didn't stop until we passed the HUGE mural. WHOA. Did you just see what I saw?? After a grueling 6 days in city traffic, we had finally escaped and found ourselves a nice slice of natural beauty. My relatives live on top of a mountain in Pennsylvania not too far from the Hagerstown, MD Supercharger and-- conveniently enough-- on the way home. Calling them from the road, we were a little concerned to find out that their well pump had died. That day. Meaning.... no water. It's troublesome enough to have house guests dropping by with children in tow, but to have them coming by WITHOUT WATER--- well, what was supposed to be the most relaxing part of the trip was suddenly in jeopardy. I actually lived in Washington, DC for a while as a child. I don't remember a lot but do have some distinct memories of the Smithsonian and flying kites on the Mall. My wife has only been there as a tourist-- numerous times-- and the kids have already caught most of the major sites. Fortunately, there's always something else to see in DC! We were definitely taking Serena out of our comfort zone a little bit though, with several days of commuting ahead of us and parking downtown. I was more than a little uneasy about the parking situation...plus dealing with DC traffic to get there! Just how good an urban warrior is the Model S?? Whew. We'd made it through The Longest Day. Whooshing and warping around Philadelphia and New Jersey had taken their toll. The wedding and rehearsal were exhausting. The traffic and immediate rerouting and recalculating our charges were taxing... but we had made it. We woke up with a renewed sense of relaxation and ready to continue our journey. Unfortunately, that journey meant going BACK through the Newark, DE Supercharger... but we'd be doing in on a Sunday morning. Surely the city of Brotherly Love would have all its citizens clustered in houses of worship and thereby clearing the highways for us, right? Right?? Well. This is it. This is the post where it all falls apart. Stress. Anxiety. Frustration. Near disaster. Okay, maybe that's a little dramatic. Remember when you were a kid and took your first ride on a roller coaster? You were convinced you were going to die, that catastrophe would forever be associated with your name and that ride-- a nice plaque maybe, to commemorate the greasy smudge where your existence ended. You shook with nervousness and built up a wall of worry that even the stock brokers bit their nails over... and then you went on the coaster. Despite both kids reaching double digit ages I still periodically find myself subjected to "kids songs". Around town these are easily avoided because the trips are short, but pack a car up and hit the open road and shure'nuff you'll find playful lyrics and corny comedy assaulting your ears soon. "Will it road trip?" Variations on that question are among the most common ones we get. "Where do you charge it-- if not at home?" My usual answer is to point out that electricity is, after all, everywhere-- the real question is really in regards to how long it takes to charge it. Well, we were about to find out. After our short shake-down day-road-trip, we were eager to see if "it really does that" on a bigger journey. So, with a wedding in New Jersey as our first destination, we charged up to nearly full, loaded up, and set out on a week-long 1200 mile trip... with no gas! We quickly found ourselves scrambling and improvising our plans, however, with second guesses and regrets clouding the first leg of our trip. Rut ro. After what seemed like months of negotiation and preparation, the Cars & Coffee / Tesla Test Drive combination finally came together! For anyone who hasn't driven a Tesla (and that's still the majority of people, obviously) it's hard to understand what it feels like. Even passenger rides (of which I've done a bunch of already) don't do it justice... you don't feel how instantly responsive the throttle is, you don't feel how reassuring the regen braking is, and you certainly don't get the full impression of just how much power is RIGHT THERE anytime you want it. Certainly many of the C&C crowd knows about vast quantities of power, but even a McClaren has SOME throttle lag. The question was, would Tesla win over any converts? Would they "fit in" with the crowd? Could some hearts and minds be won over? Only one way to find out! Driving to work, I saw the new BMW i3 behind me and decided to give it a look over (first one I'd seen in person). Having seen it, I have to say... I agree with Elon: "I think there is room to improve on the i3 and I hope that they do." Almost makes me miss Chris Bangle. ALMOST. Getting to the Church On Time... 3 States Away! Even if you don't buy a Tesla for its "green" credentials (we didn't) you can't help but notice them. Especially if you are the sort who like to go out into nature and stomp around (we do) admiring the creation. Pairing those two together... and you have a day full of satisfaction that you are taking "leave no trace" to a whole new level. Not smugness, no... not that. But satisfaction. If you were married to or dating an ugly person-- and who, in their right mind, would ever admit to that? ?-- I can imagine you'd try and optimize their appearance any way you could. Certainly if you were planning a date night that included introducing him/her to your friends you'd try and lower the expectations in advance ("she's REALLY knowledgeable about the conflict in Crimea") and also pick a venue to play to their strengths ("you should see him BOWL, I mean, put him in a dark alley and MAGIC happens"). That's pretty much how every conversation should start for the period of time when your household is beset with teenageritis. Surely somewhere there's a Parent-of-Teenagers-Anonymous support group. (OH! Is THAT what the "school PTA" is about??) It's a communicable disease that is highly contagious even to younger siblings still rockin' single digit ages. Worse still, the only known cure has an incubation period that can last well into your child's thirties. There's really not much hope... but despite the onslaught of hormones and ignorant rants, you can at least effectively treat the eye problems (or so I assume, because MY eyes don't continually deviate to the ceiling). Simply buy ONE TESLA (and call Elon in the morning) to temporarily inoculate yourself. How does it work? I'm glad you asked! Quick post-- here's some dash cam video from last week when I "chased" Jake from state inspection to detailer. Interesting to see how the regen triggers brake lights and such. Within DAYS of finding out we were getting a Tesla our kids had already worked out a plan. The same kids that can't clean their rooms without a detailed explanation of WHERE THE DIRTY CLOTHES GO had suddenly birthed the capability to land a human on Mars and return him/her safely to Earth using only Lego and rubberbands. "We got this" they said, eyes twinkling and hands rubbing as they huddled in whispered negotiations. I was not so deluded as to think OUR best interests were in their hearts-- no, they were trying to figure out how THEY would get the Tesla more often than anyone else. Out with the old... in with the ELECTRIC. Settling in with something new is always a little "disruptive". But unlike a small consumer device, with a Tesla pretty soon everyone around you knows you have something new. A Tesla is pretty "far out" and hard to ignore when parked in the Camry and Explorer laden lots about town. Ours is a subtle grey. I can't imagine the attention a red one would get... oh wait... yes I can. "This, officer, is a Tesla. T-E-S-L-A. And here's my license." She's HERE! It has been a very packed first week with "Serena". Yep, we named our car. It's the first time we've been nuts enough to do it-- and after a week, I must say, she's earned it. This car has so much personality and is so lively, you can't help but think of it as more than mere machine. That's not to say she's perfect but after a week it's hard to imagine ever buying another gas car. Serena is a DEFINITE improvement to our quality of life and-- like all big improvements-- this one came to us by way of the Home Depot. "Sourcing Parts" they say... Every time I checked the Tesla website-- for weeks-- all I saw was that they were "sourcing parts". Really?? I didn't think there were that many parts to source. Wasn't that the point? Yes, yes... I know. It's a part of the newly birthed tradition of the Tesla "waiting period". As was recently written to me (shout out to "Ugliest1", which has win an award for the most self-deprecating username ever) I'm "taking owners nostalgically back to that near-unbearable 'waiting period' feeling between car purchase and delivery". So sit down kiddies and let Grandpa Matt tell you about the days when we had to WAIT for our Teslas to be delivered. Back when they were actually dragged on open air-gravel-kicking trailers all over the country-- not 3D printed in your basement gameroom. FINALLY. It had been just over 8 years since we'd last brought a new car home-- and that one was used and 2 years old at the time! We'd delayed gratification for a long time and put up with a lot of repairs and hassles and now... NOW we were making a big plunge into a relatively unknown part of the automotive experience. Like many things with Tesla, buying the car is not your usual experience. This one was quite strange-- especially for used car shoppers like us! After a long cold Winter was mostly over-- I say mostly because PITTSBURGH. Anyway, Spring was teasing us from across the calendar and we had some faint hopes of seeing sunshine when Tesla dropped another local test drive event on the calendar on short notice. We'd already driven the cars... and done the math... but decided we'd stop by and check out the scene and maybe they'd bring some interesting news. We'd still NEVER seen a grey car in person. Surely there was no harm in just... LOOKING, right? Having once again committed ourselves to delayed gratification and having skipped two solid chances to get, essentially the same car, you'd think we would be done with Tesla for a while. 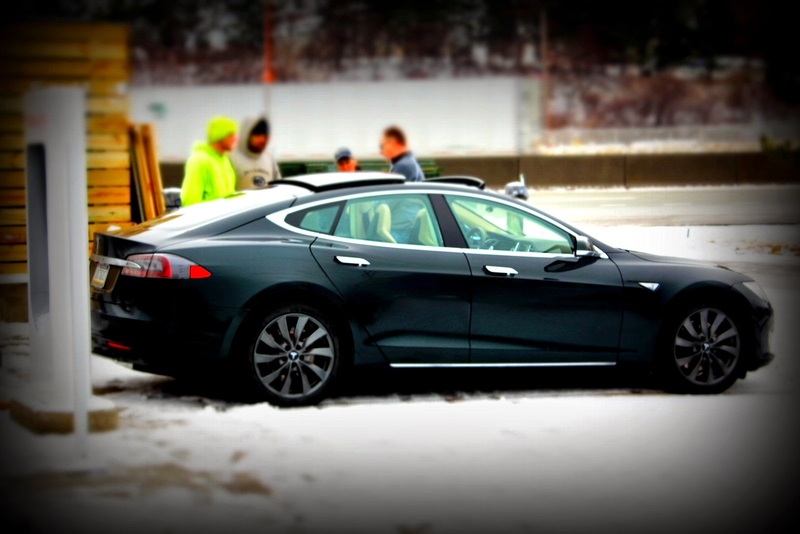 Unlike other deferred purchases, the Tesla stubbornly lingered at the forefront of our plans. The first order was a gut check but the second near purchase was a screaming wake up call. Ever wanted to cast a spell on someone? A curse even? Do the ends sometimes justify the means? I'm pretty sure that Jake, in his efforts to expand Tesla ownership in Pittsburgh, put a curse on me. Oh-- he dressed it up to be sure... but a curse is still a curse! And the curse is STILL working even though our delivery is getting close! 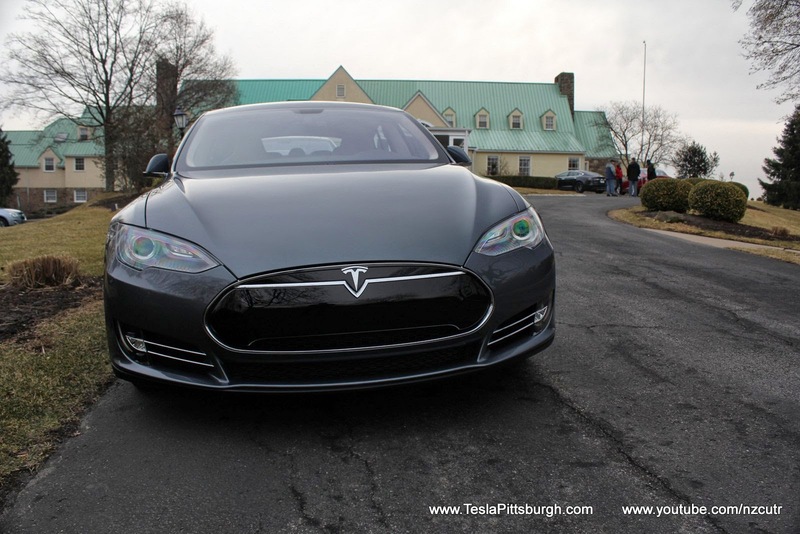 In October, Tesla conveniently scheduled a Test Drive Event in the Pittsburgh area. In fact, they scheduled one exit down the highway from us. Right when we were getting comfortable with the idea of buying a Tesla. On a weekend we didn't have other plans for. It's almost like they KNEW we were close... but closing the deal? That was still pretty much up in the air. After all, I still a number of concerns, remember? As the weather turned cooler and the leaves started to turn, we faced the looming Winter with a lot on our minds. Having vetted the Tesla idea as thoroughly as we could (and better than most could, thanks to Jake), there remained just a few barriers left between us and ownership. Two, to be exact. They were not small ones. Back home again from our Virginia trip with a renewed sense of zeal, I plunged into Tesla research. Having seen the cars on the street, having explored one in a gallery, having read all there was to read about them, I now needed to ride in one and talk to an owner. I ran a few searches and found an owner nearby... almost too close/too good to be true. A couple miles away. Was I about to make a friend or freak out a local? Having just seen my first Model S' on the streets of Chicago, a trip to Virginia was presenting a chance to see one up close... if I had the time to spare. After a day or two in Virginia on a whirlwind wedding weekend trip (staying near Dulles Airport), I gingerly admitted my desire to -- if there was extra time, of course-- try and see one of these "Teslas". I further tried to sell the idea of making time for it by pointing out that there was a Lego store in the same mall-- We have a big Lego presence in our household (Bricksburgh.com). But when and how? Last time I wrote of first discovering that the Model S actually existed, but was it a "REAL" car? I was about to find out. Cranberry's Supercharger has been up and running for a while now--- but today was the official "Grand Opening" and ribbon cutting ceremony. Jake and I went and spent the morning with the good folks of the Tesla community. Click through for more pics and video! We're just starting up this blog and will do proper introductions soon. In fact, I have a LONG introduction that I'll be breaking up into a series of posts over the next few weeks that will really let you know how I got here. My cohort Jake, aka "OUTAGAS", will have to do his own intro and will no doubt ridicule how long mine is. That's okay... I get it. He has less time to write blog posts because he's busy KEEPING HIS CAR CLEAN. 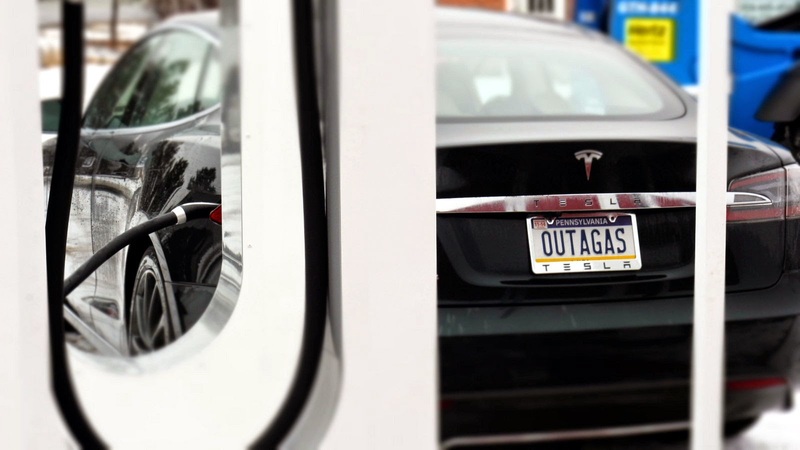 The general plan is to keep this a fun read with lots of information about our experiences with Tesla and focus on local issues related to Pittsburgh and the surrounding region. We absolutely welcome comments/questions and urge you to +1 or Follow/Subscribe as you see fit. Come on along! And let's all enjoy the drive!